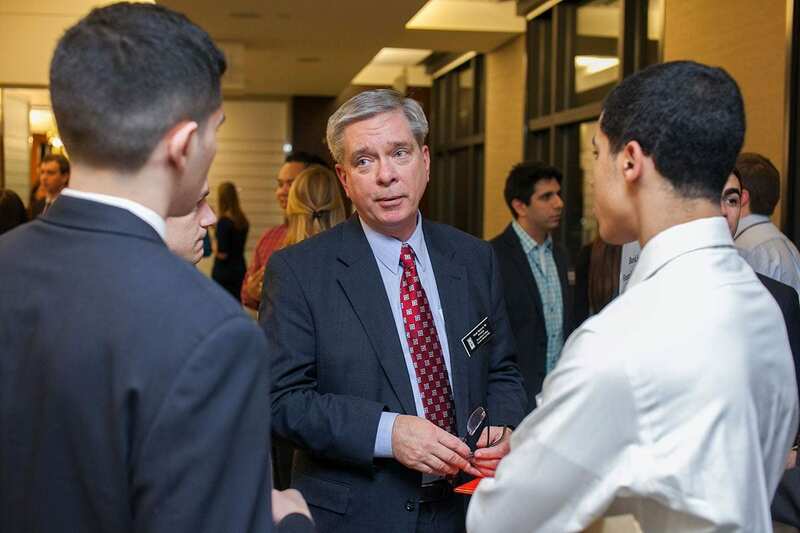 Mark McGwin ’81, the president of the National Alumni Association Council for 2018-19, speaks with students during a networking night when he was president of the Greater Boston Alumni Club. Who knew that the new president of the Providence College National Alumni Association Council once dreamed of playing professional tennis or would love to take Civ again? Mark McGwin’s love for adventure and knowledge has remained paramount since his days as an undergraduate at PC. The same can be said for his appreciation and devotion to his alma mater. 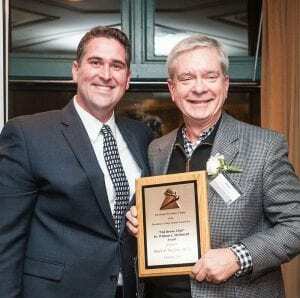 The 1981 graduate volunteered as a class agent for several years in the 1980s and has been a member of his class reunion committee four times. McGwin, right, accepts the Dr. William A. McDonnell Award from Bernard A. Manchester ’04 of the Greater Providence Chapter of the NAA, the Mal Brown Club, in February 2018. The award is given to individuals who have given unselfishly of themselves to further the cause of PC. Over the years, the North Attleboro, Mass., resident has extended his support for PC to the regional and national levels. McGwin was secretary of the NAA Board of Governors from 2000-2001. He served the Greater Boston Alumni Club as vice president from 2011-2013 and as president from 2013-2017. McGwin also was an at-large member of the NAA Council from 2015-2017 before being elected to a one-year term as vice president of the council in 2017. He became president on July 1, 2018, and will lead the College’s 57,000 alumni until next June. A management/finance major, McGwin has worked in the banking industry — mostly in commercial lending — his entire career. He has served as senior vice president and commercial banking officer for franchise lending at United Bank of Worcester, Mass., since 2014. In addition to his career and dedication to PC, McGwin has a keen sense of community responsibility. Since 2013, he has been the treasurer of NA United Alumni — Memorial Scholarship. Each year, the group raises funds for and awards a scholarship to a graduating girls soccer student-athlete at North Attleboro High School. The fund honors the life of one of the school’s soccer players, who died after a sudden illness. He also has served as chairman of the board of two nonprofits, the Diabetes Foundation of Rhode Island and the Omni Development Corp.
How did you spend the Blizzard of ’78? Stranded in a women’s dorm at Rhode Island College. It was not as exciting as you might expect. If you were a student at PC today, what class would you want to take? DWC. I am curious about the new curriculum, and there is great personal satisfaction in successfully completing that course. Who influenced you the most when you were a student here? How? Saul Siegel would frequently reference the “reasonable man” theory in his business law class. “What would a reasonable person do, given a certain set of facts and circumstances?” That concept is applicable in business, and in all aspects of our daily experiences. If you are a fair and reasonable person, things will generally work out well in all aspects of your life, regardless of the circumstances that you encounter. What value or principle you experienced as an undergrad still holds true today at PC? Excellence without compromise. PC continues to evolve, grow, and improve in so many ways, without compromising its Catholic and Dominican identity. Name one thing classmates and friends would find surprising about you. I would have preferred to travel the world as a professional tennis player for a few years before getting a real job. Unfortunately, a lack of talent prevented that!